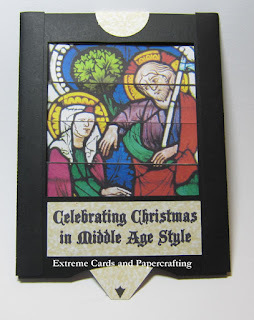 This year's extreme Christmas card theme, the Middle Ages, proved strangely prophetic--we appear to be entering the 21st century version of the Dark Ages. 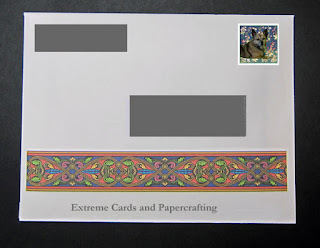 The envelope is decorated with a medieval design, a custom postage stamp (starring my dog), and a "sealing wax" blob (also featuring a dog) on the flap. 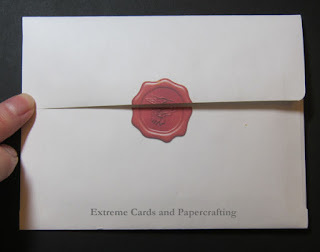 I found the tutorial for making Photoshop sealing wax here. 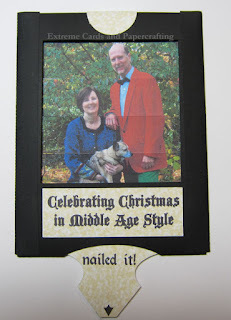 The card is a pull tab changing picture or dissolving card: Celebrating Christmas in Middle Age Style! 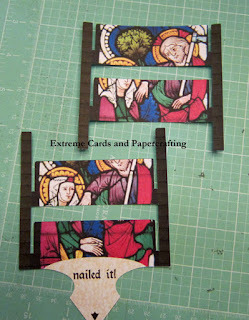 The beginning position is a stained glass window. Pull the tab to reveal the end position, and the punch line to the joke. Video of the card action. 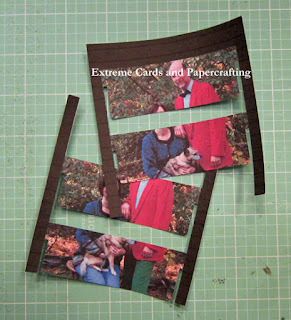 Directions for this type of card can be found in my favorite book about mechanical cards, Making Mechanical Cards by Sheila Sturrock. 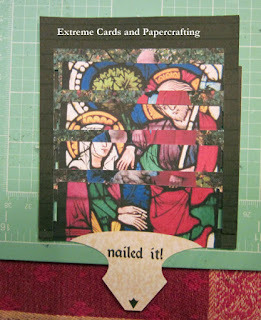 Similar card instructions online, here. Each picture is composed of two sets of interlocking slats. The two pictures are then interlaced. 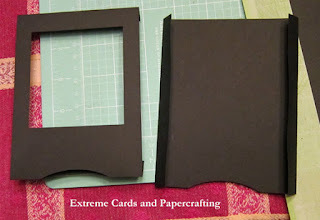 Add a black frame and backing. See every Extreme Christmas Card, dating back to 1989!